In this chapter, we have chosen an approach which perhaps ought to be taken more often in Palaeos. Rather than devoting a section to a discrete taxon, we instead discuss a grousp of taxa which bracket a key transition. In this case, the evolution of the Osteichthyes. The taxon Teleostomi itself is easily defined as, for example, the stem group lawyers > sharks, based on the anchoring crown group Eugnathostomata = lawyers + sharks. The teleostomes contains the Acanthodii, the Actinopterygii (scaly fish), and the Sarcopterygii us). However, the interesting part for evolutionary biology is Osteichthyes. This is the next great crown group: scaly fish + tetrapods -- in the short, the last common ancestor which joins 99% of the living vertebrates. 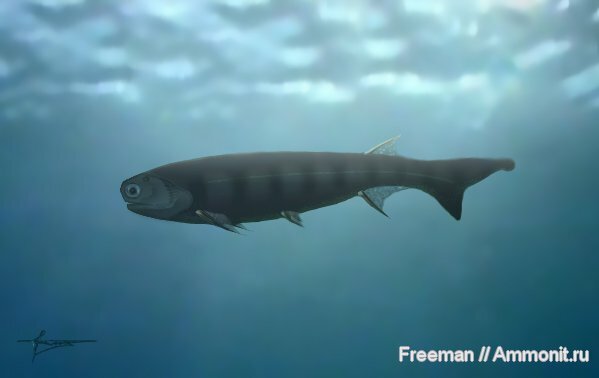 Whatever it was that this distant Silurian or Ordovician ancestor had going for it, its autapomorphies were enough to eventually out-compete every other vertebrate group. Oddly enough, we have almost no idea what this primordial osteichthian was like or why it was so sucessful. There was tremendous excitement a few years ago when details of Psarolepis were published by Zhu et al. (1999). This strange fish from the Late Silurian of China shows such a peculiar mozaic of characters that it seemed we were close to the ur-fish. However, even since that time, Long 2001) has published preliminary details of his work on the basal Onychodontiformes -- undoubted members of the Sarcopterygii -- which tend to show that Psarolepis is simply an even more primitive sarcopterygian. So, we are almost back where we started. ATW020602. We do have some idea of the basic soft tissue characters of the basal teleostomes, simply by comparing sharks with osteichthyans. Two major adaptations relate to respiration. First, the early teleostomes probably had some sort of operculum, although it was not the one-piece affair of living fish. The development of a single respiratory opening seems to have been an important step. Second, teleostomes also developed a swim bladder and the ability to use some atmospheric oxygen, if primarilly for bouyancy, very early on. The swim bladder is not found in sharks in any form. It is formed from an evagination of gut and develops as an impermeable cross-linked collagen bag between the vertebral column and gut. The primary function of the bladder is keeping the fish at neutral buoyancy. Regulation of the gas content takes one of two forms, and both may be present to one degree or another. Physostomes maintain the connection between the swim bladder and the gut. Gas content of the swim bladder is regulated by gulping and burping air. Physoclists have gas glands. These secrete lactic acid to a rete mirabile (countercurrent capillary network) in a side-pocket of the bladder which dissociates oxygen from hemoglobin. Oxygen then accumulates in the rete until pressure causes it to diffuse into bladder. The bladder also has an opening to another compartment which contains a capillary bed which absorbs excess oxygen. The step from the physoclist condition to air-breathing is, of course, a small one. ATW020602. From the Late Ordovician or Early Silurian. Eugnathostomata: Chondrichthyes + *: (Acanthodiformes + Ischnacanthiformes) + Osteichthyes. Mouth terminal; braincase deep and narrow; braincase shows ventral fissure, otic-occipital fissure; separate ant and post nostrils; large bone operculum and/or branchiostegal rays. Large toothed bones on palatoquadrate (looks like a shark); dermal pectoral covering reduced; 1 large gill cover; fin spines slender, with orthodentine superficial layer; some large (2m) species. Late Silurian to Early Permian. Extramandibular bone present; large orbits; well-developed gill rakers; 1 dorsal fin; 1 very large gill cover; no teeth; no intermediate spines between pectoral and pelvic fins; some elongated forms.